As Stephen Colbert said this week, the shutdown has been going on for so long that we’re running out of jokes about it. We had that egg and the hamberders and the dueling Fyre Fest docs, but the main story yet again was about something not happening. So how do you put on a late-night show without it seeming like Waiting for Godot? Big, nasty stunts. For starters, Kirsten Gillibrand announced her presidential candidacy on The Late Show. Somehow I escaped the entire Al Franken and Kavanaugh news cycles without knowing that Gillibrand is pronounced with a soft G, like the way the guy who invented gifs says you should pronounce gif. (He’s wrong, by the way.) Announcing your candidacy on a late-night show is a rarer move than you’d think. Last election cycle, candidates mostly announced at rallies or in self-published YouTube videos. Gillibrand chose to announce on the second highest-rated late-night show, with arguably the most political host. To many people, Colbert still represents a shiny, Obama-era political literacy. If you want to tap into the people who are young enough to vote Democrat but old enough to vote consistently, you go to Colbert. You used to go to The Daily Show, but Trevor Noah is too impish to be the person you announce something with. The Daily Show announced its primary coverage moniker this week, “World War D.” And during that coverage, Noah ran through the studio to celebrate getting a groan for a Hillary joke. That’s not where you go to announce your candidacy. Noah falls more into the “comedy is saying stuff you shouldn’t” vein of late-night host than his counterparts. The jokes are there to push. And sometimes when the goal is pushing, being funny kind of falls to the wayside. This week, Noah did the best famous-egg joke, then followed it with the laziest General Tso’s joke. That’s what happens when your focus appears to be provocation and not quality. What is Jimmy Fallon’s ultimate goal? It’s certainly not to provoke. Is it to be liked? Fallon went to Puerto Rico this week and basically made a glorified tourism video. That’s fine. Puerto Rico seems to feel like tourism and investment in small business are a safer route to recovery than relying on federal funding, and that’s probably the case. Very little of Fallon’s trip to P.R. was funny, but maybe being funny wasn’t the point. Maybe as the host of the Ur-late-night show, Fallon feels he has to set America’s talking points. That role has so much cultural baggage. In an early Kids in the Hall sketch, “Touch Paul Bellini,” Mark McKinney announces the winner of the Touch Paul Bellini contest by standing behind a suit on a mannequin. He never wears the suit, he merely hides behind it. That’s what any host does on The Tonight Show: They stand behind the show; they don’t wear it. The main way Fallon distinguishes himself is his willingness to be the omega dog on his own show. He’s willing to let José Andrés roast him for six minutes. Carson would not. Also doing what other hosts would not: Busy Philipps. Her voice is singular in the late-night sphere because it’s both (1) female and (2) Extremely Online. And those two spheres overlap most fully in the pimple-popping subreddit. Actually, the most female and online sphere is any Facebook group that warns each other about multilevel marketing schemes, but pimple-popping is No. 2. Busy had Dr. Pimple Popper herself on to teach good extraction techniques, and they used cupcakes. It was the only stunt this week that evoked genuine body horror in host and viewer alike. 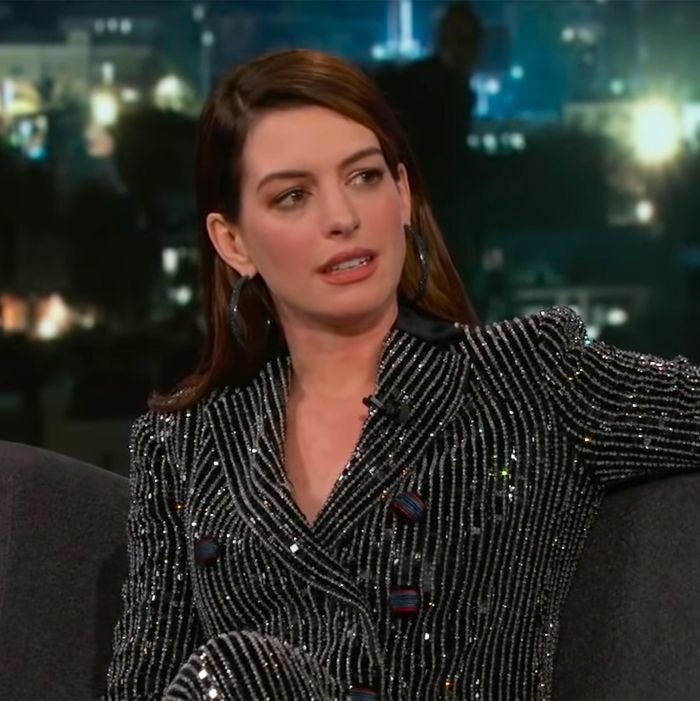 But the most audacious stunt and the best performance of the week goes to Anne Hathaway for reinventing the Matthew McConaughey impression. As Jimmy Kimmel pointed out, most people don’t go beyond the “all right, all right, all right” of McConaughey. But Hathaway manages to get to the thrown-away aphorisms — the Zen, almost motivational-poster patter of his speech. The secret to a great impression isn’t accuracy, it’s having a thesis statement. Before Hathaway’s impression, I hadn’t thought about what a good cult leader McConaughey would make. Now I’d happily join.